A foundation brush is used to apply foundation. Our Precision Foundation Brush has a flat, curved bristle shape that allows for highly controlled, quick and even application of a range of foundation formulas, including liquid and cream. Pro tip: Start your foundation application at the centre of your face and blend out towards the hairline and neck. This will help you avoid foundation built-up around the edge of the face. A powder brush is used to apply any kind of powder (like a setting or bronzing powder). Our Precision Powder Brush lifts powder with ease and ensures perfectly even application and a light, smooth finish. Works wonders with loose and pressed powders. Pro tip: Apply your powder with even, circular movements for an even more flawless result. A concealer brush is used for precise application of concealer. Our Precision Concealer Brush has a thin, tapered top that perfectly conceals dark circles and the area around your eyes and nose. Pro tip: Get perfect cover by gently tapping the concealer onto the skin and then feathering the edges until blended. A fan brush is most commonly used to apply highlighter, blush or bronzer. Our Precision Fan Powder Brush has flat, fan-shaped bristles that’ll always give you a naturally flawless result. 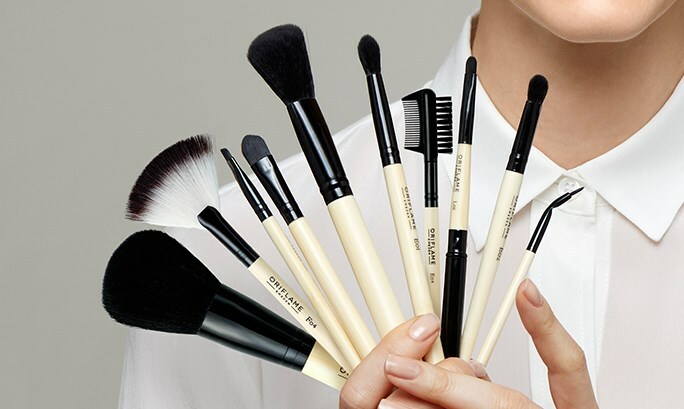 Pro tip: A fan brush is also a great tool for brushing excess powder off your face. A blush brush is used to apply blusher. Our Precision Angled Blush Brush has slanted bristles that lift powder with ease and give you an even, natural application. This is a great brush for blending and contouring the cheeks to achieve a more defined, sculpted look. Pro tip: Smile to accentuate the apples of your cheeks, and simply dab your blush on the centre of the cheeks. Then you can gently blend the blusher with circular movements upwards at an angle toward your ears. A lip brush is used to apply lipstick. Our Precision Lip Brush is a dense, small tapered brush perfectly designed to define the lip contours and evenly apply intense colour. Pro tip: Prep the brush with your favourite lipstick colour and slip it into your handbag for quick touch ups throughout the day. An eyeliner brush is used to apply colour from a pen, cream or liquid eyeliner. Our Precision Angled Eyeliner Brush has an angled head that reaches over your lashes for trouble-free application along the upper and lower lash lines. It’s ideal for cream based liners or your favourite eye shadow. Pro tip: Always start thin and then build on the line if necessary. An eyeshadow brush is used to apply eyeshadow. Our Precision Double Ended Eyeshadow Brush has a rounded shape, which will give you better access to all areas of the eye. The sponge tip allows for more precise and intense application of colour. Pro tip: Apply eyeshadow to the crease for a more intense look and emphasised shape. A blending brush is used to blend transitions between eyeshadow colours. Our Precision Blending Brush has soft bristles with a wider cut that are great for shading. Pro tip: Press gently so the bristles spread out. This will help the colours blend into each other without leaving harsh lines. A comb is used to shape eyebrows and remove clumps from eyelashes. The brow brush on our Precision Brow and Lash Comb has shorter bristles – perfect for blending brow colour. The lash comb lets you polish your lashes. Pro tip: Dip the brush side in brow colour and brush through brows for a natural look. An eyebrow brush is used to apply brow colour. Our Precision Angled Eyebrow Brush has firm angled bristles, which makes it easy for you to define or fill in your brows. Pro tip: For a natural look always start where the hair is thickest. Then use short strokes instead of long lines.